Any critical engagement with the politics of religious discourse that begins by acknowledging Al Swearangen and Joe Strummer has to be worth more than a second look. At least I’ve made the assumption that is the Joe Strummer and the Al Swearangen. It’s possible I’m reading too much into it and they are referring to Professors Strummer and Swearangen who are comfortably ensconced in chairs at Sydney Uni. I’ll go with my first assumption as it gives me a better springboard into Politics and Religion in the New Century, edited by Philip Quadrio and Carrol Besseling. Swearangen, like another of TV’s moral pundits, Gene Hunt, is, to say the least, a morally ambiguous character with more accumulated machismo and misogyny than Schwarznegger’s Terminator. Strummer’s entire lyric output seemed to be a long struggle to bind moral clarity and political outrage. This is something of the temper of the book, the marrying of political outrage and moral clarity. There’s a clear intention too of wholeheartedly mixing it with the morally ambiguous and ideologically violent and those who are just plain dishonest in their use of argument. The first two essays of Politics and Religion illustrate this neatly. The first by Peter Slezak, ‘Gods of the State’, is a killer and a great opener. Slezak cuts a swathe through the pro-atheist arguments of Christopher Hitchens, Richard Dawkins, Sam Harris and so on, and reduces their arguments and propositions to roadkill. One might argue that this is not difficult, as generally Hitchens, Dawkins and Harris are about as philosophically sophisticated as Scooby Doo, but Slezak does an excellent, fair and rigorous demolition job – one of which Swearangen might be proud – while at the same time identifying the functions of political silence and problematising some of the responses to Hitchens and his chums by critics such as Terry Eagleton. Slezak’s very entertaining paper leads straight into Michael Levine’s also excellent if somewhat wordily titled ‘Philosophy of religion’s political character; myths of tolerance and the re-sanctification of politics’. Like Slezak, Levine doesn’t mince words. 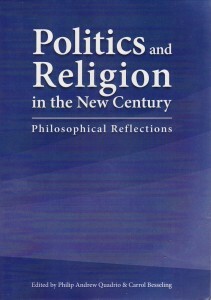 ‘Philosophy of religion,’ he contends ‘is regarded by mainstream philosophy as somewhere between a quaint and poor relation on one hand and an irrelevant anachronism on the other.’ The attempted reconciliation, in some academic quarters, of religion with science is actually a cover for a conservative political agenda says Levine. As he puts it, very nicely I think, ‘Even blind Freddy can see what cash-hungry university administrators ignore’. Levine, like Slezak and other contributors to Politics and Religion, is attempting to clearly name the political in religious discourse and foreground it as something we need to urgently engage with. The arguments between militant atheists and the ‘religious’, for example, are not arguments between polarities of reason and faith. But neither are the attempts by religious conservatives to ‘reconcile’ reason and faith apolitical. Religion, like literature, like science, like cricket, like the Vietnam War, is composed of political subtexts. Religion is not politically neutral, anymore than literature is. This doesn’t mean that religion is ‘just’ politics, but that religion is composed of people who practice it, of their institutions and ideologies, and it has its own unique way of constructing politics. Most of the people who have ever lived, as Adam Phillips pointed out, have been religious. This doesn’t place religion as a primitive leftover on the relentless ascent to a scientific reasoning of which Richard Dawkins is the pinnacle, but centres religion as a unique human discourse that has been integral to the construction of human politics. But the political and the religious have never been far away from each other and have again become sinisterly intertwined over the past decade or so. Bush II’s neocon administration was dominated by the Christian evangelical hard right, by people who are on record as saying that mental illness is caused by demons, that Satan wants to destroy the US, that George W Bush was appointed as President by God, and who funded research into prayer as health care for the poor, publicly invoked Jesus in times of national crisis, and quoted scriptural authority as political authority. Bush himself claimed that God spoke through him. Tony Blair is said to have consulted the Bible before making major decisions. The Howard Government was notoriously cosy with evangelical Christian groups, such as Hillsong. Julia Gillard sanctimoniously parrots the Christian right’s line about marriage only being possible between a man and a woman, not because she believes it, but because she thinks it is politically advantageous to sound as if underneath that Modern Girl exterior is someone’s corsetted, churchgoing Victorian aunt. It is difficult to problematise the politics of religion in public debate because religion, like sport, is considered to be politically neutral, to transcend politics. Metaphysical beliefs can be effectively used to shut down political inquiry, as Paul Crittenden points out in a later essay of Politics and Religion, and, in fact, to shut out dialogue of any kind. More than anything else, I guess Politics and Religion can be seen as an attempt to open up the politics of silence, to find that fracture point where interrogation and dialogue are possible, and to attempt this in multiple ways from multiple viewpoints. If the religious are not always politically informed, then it’s probably true that the politically minded are often not religiously informed. Politics and Religion tries to open something out, something that is all too often closed, and whether you’re dedicated to the Beatitudes or the Heart Sutra or Foucault or George Pell, there is a dialogue that urgently needs to take place, that could transform the geo-politics and social engineering at which lies the heart of a religious politics that is neither open nor dialectic. Politics and Religion contains thirteen essays all up, and establishes a diverse forum for the debate we could be having, but aren’t. That’s one of the things that makes it such an interesting tome I think: its power to engage a political thinking that the writers had obviously done a lot of themselves. Engaging with the politics of religion is something we are increasingly going to have to get our heads around this century as mediaeval America flexes its military muscles, or goes looking for its new Sputnik moments. 1. A book that has the nous this one does, that acknowledges Al Swearangen as an inspiration for debates on moral and religious politics, could probably have a hipper cover. The cover of the review edition I’ve got looks like reject desktop wallpaper from Windows 95. 2. It’s possible too that the review edition is some kind of leftover from the proofreading. That would explain the alarming number of typos. 3. It might also explain the total and unforgivable absence of an index. 4. Academic writing can be very ugly. There’s not a lot we can do about that without wholesale reformation of academia. But when one comes across lucid conversational prose, as we often find in Politics and Religion, inline citations make what would otherwise be reasonably fluent, clumsy and ugly. And if you’re trying to include the non-academic population in your audience, inline citations are not likely to prove engaging. For example, a sentence that begins ‘Given the sheer quantity of bombing, Chomsky (1971:227) has noted …’, continues with a hard-hitting quote from Chomsky, and then finishes with a another footnote referenced at the bottom of the page with another quote, is not helping itself. The entire text is littered with footnoting like this, so the effect of the page layout is as if someone had spilled a bowl of numeral soup over it. Having just finished a postgrad degree, I realise that academia is exceptionally paranoid about plagiarism, but there have to be more discreet and prose-friendly ways to acknowledge one’s sources. 5. Every contributor gets a brief bio except one of the editors, the mysterious Carrol Besseling. Perhaps it’s Al Swearangen’s pseudonym. Either way, whoever he or she is, congratulations and thanks. I’ve read Slezak’s essay too and agree it’s excellent. But I think saying it cuts through “pro-atheist” arguments is misleading, most obviously because Slezak is an atheist and isn’t making an argument for atheism. The point of his essay is that these advocates of rationalism deplore religion, and write about how it manifests all this irrational worship, but then goes on to say people like Sam Harris instead worship the State, and don’t bother addressing irrationalism in the political sphere, even though secular forces are responsible for far more evil in the world than religious forces. Hi Michael, Yes, I realise that Slezak is an atheist. I was merely drawing attention to the fact that he was attacking the arguments of those who are ‘militantly atheist’. It might have been a more apt phrase than ‘pro-atheist’ which reads somewhat clumsily. Stephen, I dare say I enjoyed reading your review far more than I would actually enjoy reading the book. There aren’t enough references to Scooby Doo in book reviews these days, especially not in relation to Dawkins. It’s true I think that academic tomes can take themselves too seriously, and a bit more of an attitude that it’s all something of a Scooby Doo exercise would be very helpful I think. The P&R crew took their reference point from Deadwood and Swearangen, which at least is something, though I’m sure I said something abour Deadwood in an earlier Overland blog (Let me go look…….., yes, I did: \…Deadwood, a hard-drinkin’ cable-TV epic about the legendary Dakota frontier town where men were men, and women took their clothes off. Or perhaps it would be more accurate to say, where men were men and had deep and complicated interior lives and women took their clothes off.\) Though the misogynist uber-male rantings of Swearangen don’t quite rise to the heights of irony that referencing Scooby Doo would have done, P&R is still an attempt to bust up a very unhealthy politics/religion dynamic. Nice effort. And they would have done it too if it wasn’t for those durn kids.